See our Personalized Boxed Chocolate Pricing Guide below for approximate costs, or click here to request a Custom Quote. Click for larger images in new window. Perhaps a box of our finest selections of assorted chocolates in a custom made box with your name and logo on the cover. We have a wide selection of box sizes, colors and print styles available to you. With this selection you can create a box in any price range. See our Personalized Boxed Chocolates Pricing Guide below for approximate costs, or click here to request a Custom Quote. Our deluxe assortment and your personalized box makes a great combination. Deluxe Assortment includes our finest buttery caramels, glazed fruits, freshly roasted nuts and mouth watering creams, all covered in Milk and Dark Chocolate. We would be happy to fill your personalized box with the chocolates of your choice, including nuts & truffles, all-creams or maybe all cherries. We're here to make your sweet dreams come true! Also see Custom Molding for other great corporate gift ideas. Please contact us for more information or click here to request a Custom Quote. Tins come in an endless selection of shapes and sizes. 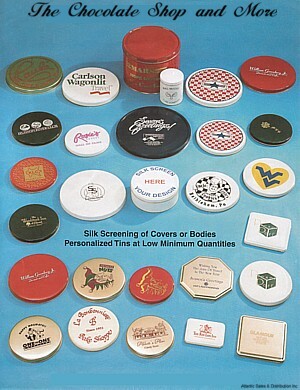 We can fill your personalized tin with a large assortment or just a couple of your favorite items. 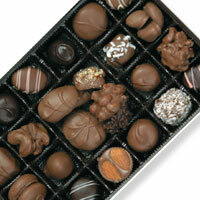 Pricing for tins will be determined by the tin size and your selection of chocolates. Click here to request a Custom Quote. Personalized Tins with your name and logo can be setup for a one-time plate charge of only $150. Then you only pay a small per each price for tins depending on quantity. There is a 50 tin minimum order required. Please allow five weeks lead time for personalized tins. 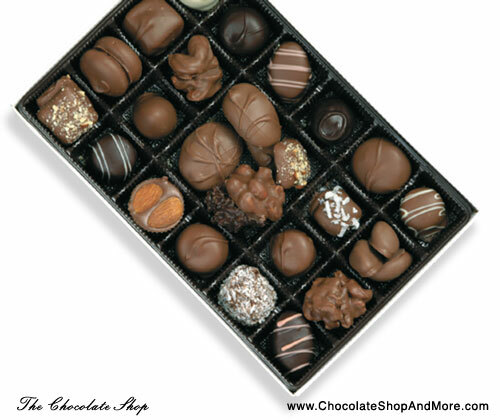 One option is to fill your personalized box with a fine selection of our assorted chocolates. Boxes less than 1/4 lb. are also available! Personalized boxes with your name and greeting NO EXTRA CHARGE. For Logos and insignias there is a one-time setup and plate charge of $75.00. There is a 50 box minimum order required for personalized boxes. 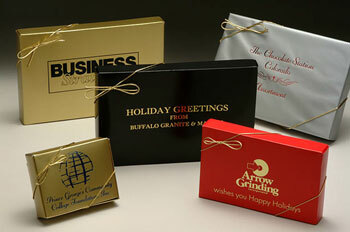 Shipping envelopes for boxed chocolates are available for only $0.85 each. Gift Wrapping is available for only $0.75 each. Mailing service is also available. Contact us for more info. 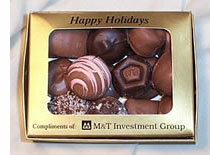 It would be our pleasure to fill your personalized box with the chocolates of your choice. Whatever you can imagine, we're here to make your dreams come true! Pricing is determined by your choice of chocolates. Contact us for more details and/or custom quote. For Personalized Orders there is a minimum order requirement of 50 boxes. Save Big on large orders of our Deluxe Assortment. If your order totals more than $1,000.00 before tax, the following discounts apply. Please contact us for Deluxe Assortment orders over $4,500 for discount information.